The question for today is: what are the important messages that telecoms players need to know? Here are three that I unearthed. 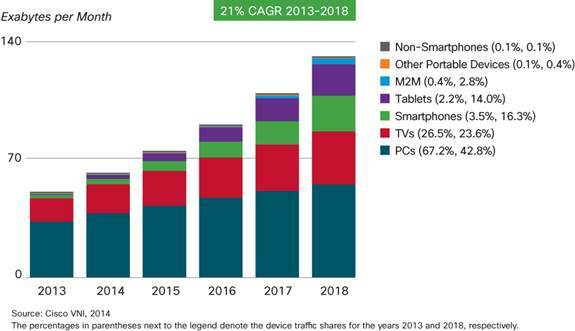 Pretty much every device will be mobile and untethered (wireless) in 2018. 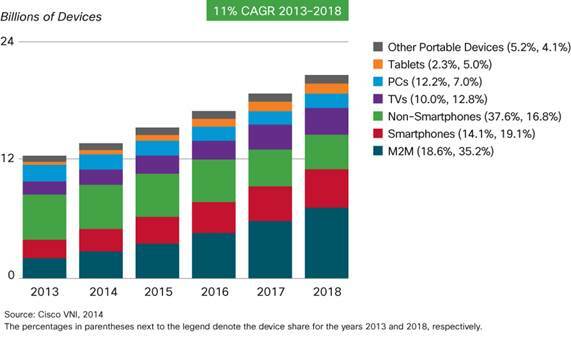 And 80% of devices will be “designed for mobility”: smartphones, tablets, M2M devices and other portable devices. Overall, 57% of global IP traffic will be delivered wirelessly. However, traditional mobile networks (3G/4G etc.) will only capture 12% of global traffic (up from 3% today), whereas Wi-Fi will account for 45%. In other words, Wi-Fi will still represent 80% of wireless in 2018. Telecoms operators who don’t have a strategy to be relevant in Wi-Fi are voluntarily excluding themselves from being their customer’s go-to provider for most of their wireless needs. This seems a dangerous strategy to take. Cisco VNI 2014 is predicting a 21% annual growth rate of IP traffic over the next five years. That growth, however, is unlikely to result in additional market value. If we assume that underlying unit costs (and, in a competitive market, prices) decline at – say – 20% per year, then this would imply that overall connectivity market would shrink at about 3% per year. Now this might be overstated, as busy-hour traffic drives costs, and that actually increased 32 percent in 2013. However, the message is clear: traffic growth is not going to drive massive market expansion. Instead, service providers will have to work (very) hard if they want to deliver increasing value around connectivity, such as authentication and identity, enhanced security and service prioritisation. M2M devices represent 35% of connections in 2018 but not even 3% of traffic. Many telcos still have fairly unambitious, connectivity-orientated M2M strategies. Even at a premium price, connectivity-oriented M2M will not be a major financial lever. Operators need to start to talk business outcomes with their customers: pure transport will not make the financial difference that operators need. This conclusion aligns with recent findings from Machina Research, suggesting that connectivity is at best a few percent of the total business value opportunity from M2M. Have you read the 2014 Cisco Visual Networking Index (VNI) report? Please leave a comment with your perspectives! Disclosure: I work at Cisco. However, like anything on this blog, all analysis is my own personal interpretation and not necessarily that of Cisco. Furthermore this analysis is based entirely on publicly availably information. To your point #3 on M2M here’s some additional insight on the challenge facing operators to make a connectivity-based M2M strategy viable relative to other major revenue contributors. Ken, thanks for this link: it reinforces the point exactly and shows why “business as usual” (i.e. 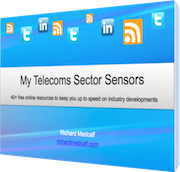 connectivity-focused) expansion into M2M is not going to move the needle in the way telcos would like. Thanks again. Wolfgang – good point. All telecoms is moving to a wireless “last X” (where X can be a metre or a mile or more!) connecting to a fixed network. As traffic density increases, X decreases and the fixed network gets closer to the user.